Sarath Kumara received the B.Sc. Eng. (Hons) degree in Electrical and Electronic Engineering in 2004 and M.Phil. degree in 2007, both from the University of Peradeniya (UOP) Sri Lanka. He obtained his PhD in 2012 from Chalmers University of Technology, Gothenburg, Sweden. Currently he is a senior lecturer in the Department of Electrical and Electronic Engineering, University of Peradeniya. 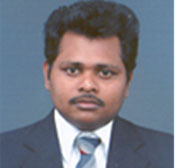 He is a member of IEEE and Associate member of IESL. His research interest includes polymeric insulations, gas discharge simulations, high voltage testing and power system modelling. Ph.D: Chalmers University of Technology, Sweden (Dec 2012). Tec. Lic :Chalmers University of Technology, Sweden (Nov 2009). M.Phil:. : University of Peradeniya, Sri Lanka (Oct 2007). B.Sc :University of Peradeniya, Sri Lanka (March 2004). Ceylon Electricity Gold medal and Prize for the Best performance in Electrical and Electronic Engineering in Final examination in Engineering, University of Peradeniya 2004. R. H. Paul prize for Electric Power and Machines, University of Peradeniya, 2004. W.M.G.Fernando prize for Electronic Communications, University of Peradeniya, 2004. University Prize for academic excellence, University of Peradeniya, 2004. E.O.E. Pereira award for the best performance in Final part II examination in Engineering, University of Peradeniya 2003.